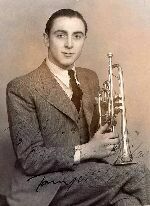 By the latter part of the 1930s there were various British musicians who yearned to follow in the footsteps of the triumphant US swing stars and two definate attempts were made to form swing groups. The first, that enyoyed limited success for a short while, was that of pianist Eddie Carroll, then came the short lived Heralds of Swing. With banner headlines the Melody Maker of February 11th, 1939 announced the formation of the Heralds of Swing. The concept of the orchestra was idealistic, originally stemming from a period in late 1938 when several members of Ambrose's old band were working only occasional gigs and amongst themselves discussing the idea of forming a co-operative unit in the swing style. Over a period of three months various other musicians were approached and with the advice of Leonard Feather and the help of Leslie Macdonell of M.P.M. Entertainment Corporation Ltd. the dream became for a time reality. Severall of the musicians left well paid jobs with star bands to become part of the Heralds... the personnel finally lining up as Tommy McQuater, Archie Craig (trumpets), George Chisholm (trombone), Dave Shand, Norman Maloney (altos), Benny Winestone (tenor), Bert Barnes (piano), Sid Colin (guitar, vocal), 'Tiny' Winters (string bass) and George Fierstone (drums). Macdonnell meanwhile had heard that Arthur Rosebery, for the past fifteen months leader of the band at the Paradise Club, was leaving the job as a result of other commitments and persuaded the management to audition the Heralds . They did so and were so pleased at what they heard that they booked the band as their resident group. In retrospect it seems unlikely that any other club would have even considered booking the Heralds, but the Paradise occupied a rather unique niche in London club life. When Rosebery moved in late in 1937 as it's musical director the club, a bottle party venue which started to come to life at midnight and went on until dawn, was struggling to survive. Within a short while Roseberry had made it one of the most successful of all London clubs, in part the lavish spending on floor shows and cabaret acts, and it's impact was such that other clubs who spent more parsimoniously on entertainment were being driven to the wall. Rosebery's own band was by all accounts a good one, and by the standards of the day the clientele of the club was sophisticated and might conceivably accept a swing style band. The musicians were paid well, and their opening on Monday 20th February 1939 was, according to the Melody Maker dated February 25th highly successful. It reported: "On Monday night they electrified the Paradise habitues, and the dancing on the midget floor became more and more amazing as the band rode through it's special arrangements and subsequently it's repertoire of stock numbers." "Couples were even Charlestoning in their excitement, and the amount of applause given to the musicians from the tables was particularly remarkable. The Dance Musicians' Advisory Committee of the London branch of the Musicians Union were at this time organising a "Jazz Jamboree" to be held at the Gaumont State Cinema in Kilburn on Sunday, March 26th, the proceeds of which went to the Musicians Union Benevolent Institution. They invited the Heralds to take part in the concert along with amongst others, Ambrose and his Octet, Billy Cotton and his Band, Nat Gonella and his Georgians, Jack Harris and his Band, and the bands of Jack Jackson, Sydney Lipton, Joe Loss, Jack Payne, Lew Stone and Van Dam. A report of the event in the Melody Maker of April 1st bemoaned the fact that that the Heralds, through pressure of bands were only given time to play two numbers commenting: "Their sensational playing however no doubt whetted the audiences appetite for more, and should result in a full house at this Sunday's first "Sunday night Swing Club Concert" at the St. Martins Theatre where the boys are acting as house band." The reference to the "Swing Club Concert" highlighted a new venture that was sponsored by bandleader Geraldo who had business interests in the St Martins Theatre. He planned a series of regular Sunday swing concerts featuring star bands and instrumentalists, admission fees to be moderate. The first concert did indeed feature the Heralds and this date, Sunday April 2nd, was one that jazz fans of this period can look back upon with nostalgia. In the afternoon Selmer Ltd presented a jam session at the Phoenix Theatre, Charing Cross Road, featuring well known instrumentalists from various top dance bands in a variety of combinations and as it's headline attraction Coleman Hawkins, of whom the Melody Maker reporter wrote: "disregarding for the most part all tonal refinements, he shot over chorus after chorus, built up the most fantastic phrases - hundreds of them and all entirely and uniquely his own." After this a section of the audience waited an hour before making their way to the St Martin's Theatre to hear a programme that presented not only the Heralds of Swing but Una Mae Carlisle, Don and Jimmy McAffer, the Radio Revellers, George Shearing and Fats Waller. Disappointingly, of the five hundred seats nearly two hundred were unoccupied, possibly due to the fact that Coleman Hawkins was playing an evening engagement at Wood Green. The April 8th issue of the Melody Maker report said of the Heralds that: "they struck brilliant form with George Fierstone on the drums amazing everybody with an incredible display of rhythms, which owing nothing to Gene Krupa, would certainly not have disgraced the American master. The band is grand - that was the universal verdict." Only a month laterr in it's issue dated May 13th the same paper reported that barring miracles the Heralds of Swing would be no more by the end of the month. A recession in the night club business had resulted in the Paradise giving the band notice and they had been asked to reduce their numbers if their agency was to have any chance of obtaining them future engagements. They decided that there was no purpose in doing so and that if they could not remain together they might as well go their separate ways in returning to economically rewarding work with leading dance bands. 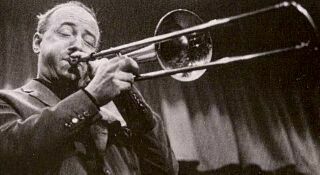 A week later the Melody Maker carried a sad banner heading "Last Post For Heralds Of Swing" reporting that George Fierstone had joined the Sid Millward band at the Cafe Anglais and that other of the Herald's personnel were seeking jobs elsewhere though the fact that most of them had continued to undertake studio work during the Heralds period. So the total history of the Heralds of Swing encompassed a period of slightly less than three months. Memory is notoriously fallible when recalling events after a time lag of over three decades, but I recall that the one broadcast I heard by the band was very disappointing. In it's May 13th number the Melody Maker gives reasond why I may well be right, claiming that it broadcast from a tudio with dead acoustics, the actual designation of this studio being B.A. In addition the Heralds were given time for only one or two titles on a programme intended for family entertainment, on the surface hardly an ideal spot. The BBC in fact were hesitant in their attitude to the Heralds finally deciding to give them a feature broadcast in June, an event which needless to say did not materialise. With only one poorly conceived radio broadcast and no records the Heralds of Swing are vaguely remembered by a few collectors as a news story in musical periodicals of their day. I did not personally attend the St. Martin's Theatre concert but friends who did told me that the band was a good one with Bert Barnes and George Chisholm contributing excellent arrangements. It is doubtful if the band, however good the individual musicians, could have equalled the impact of a top US swing band in any case, for by comparison it was short of two brass men and one saxophonist. If the history of the Heralds of Swing was a short and not very happy one, it is another reminder that musical idealism was no less in evidence during the swing era than any other period of jazz, a fact that appears to escape the attention of those critics whose writings carry an implicit suggestion that big bands were merely an unfortunate interlude between the New Orleans small groups and the present day avant-garde musicians. World War II was not far away and many of the musicians went into the RAF Dance Orchestra which following the war became the renowned Squadronaires. This page was last updated during February, 2012.